Did you know Liberty of London makes swimsuit fabric? I sure didn’t! But I was lucky enough to be given the opportunity to sew some up recently, courtesty of The Fabric Store. The special occasion is because they are now stocking it in their online store. Given the amount of swimsuits I’ve been sewing lately, I’m super excited to have another source of beautiful swimsuit fabrics at my online fingertips. It’s no secret that swimming has become a family affair for us. All three of my daughters enjoy the sport, and my two eldest girls currently identify as mermaids. In fact, it’s because of them that I found myself back in the water. Over the past year, I’ve been gradually increasing my swim volume and boosting my fitness with as much cross training as possible (within the time constraints of adulthood!). At some point along the way, I agreed to join the Missouri Valley team at the US Masters Swimming Summer Nationals. The key relay organiser obviously saw more potential in me than the confidence I had in myself at the time. Anyway, to cut a long story short (so I can get back to raving about Liberty of London swimsuit fabric! ), I recently got back from competing in Minneapolis. It was amazing!!! The nerves, the pain, the competition. I don’t quite know where it came from, but I raced like I’d never left the sport, and came home with golds in the 50m, 100m, and 200m backstroke, as well as three additional relay golds. My times were a lot slower than what I was doing 20 years ago (as expected! ), but I was extremely happy with myself, and I can see a lot of room for improvement yet (before old age does me in!). I’ve posted a couple of photos and a race video on IG for anyone interested. Meanwhile, my girls and I have all had a nice, little break from the pool, and we are all about to jump back in for the new season. There’ll be plenty more bathers sewn over the coming year, but I actually have bigger plans afoot than outfitting the family. At the moment, I’m busy perfecting a couple of sample blocks (both for myself (size 34) and my girls (size 26)). I’m investigating having them professionally graded. 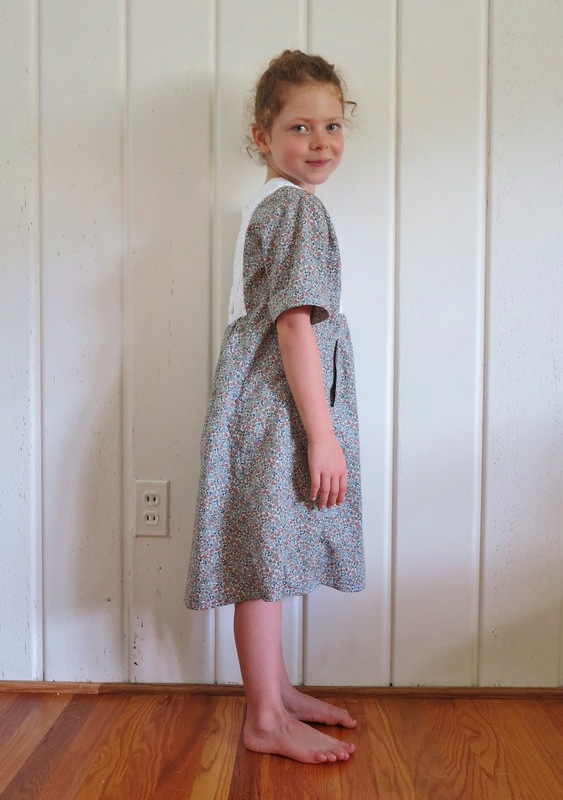 It’s anyone’s guess what will happen after that, but at the very least, it will be nice for me to have more than a single size to sew for my three girls! I’ve already sewn up two suits from my Liberty of London fabric, and I have a few more raring to go on the cutting table. I’m not quite on top of my photos, but there are plenty of sneak peeks on my IG accounts. This particular suit was sewn up for Miss Seven in Mistral/B. Miss Nine is wearing it in the photos for a sample size study because she fits the measurements more closely (and she’s much less fidgetty!). She’s on the upper end of the size range for this suit. It fits her perfectly and it would be great for racing, but she could stand to go up a size for practice. It looks like a pretty simple suit, but it’s taken me about ten versions to get to this point. There is more to a practice suit than meets the eye, and it’s no different for a kid than an adult. You need to consider the height of the neckline, whether it will slip down with swimming, pressure of the straps on the shoulders, no scratchy elastic edges on the back, a secure fit through the chest and hips (that FEELS secure to the swimmer too), a bottom that doesn’t balloon with water each time you flip-turn, non-restictive leg openings, and of course the elimination of seams that rub under the arms and at the neck with repeated arm motion. I think we got it covered with this suit… finally! I don’t tell this girl which suits to wear for practice, but I can see that she prefers my design now over her multitude of others. But back to the fabric. It really is very lovely. It’s a quality, mid-weight swimsuit fabric, with great stretch recovery and a beautiful smooth feel to the hand. I know I should expect nothing less from Liberty of London. The fabric composition is 72% Polymide, 28% Elastane, so I’m guessing it will perform well in the pool, and last even better if lined. I fully line all my suits because the lining significantly prolongs the life of the suit. It creates a barrier between a hot, sweaty body to slow down the degradation of the lycra. It also protects modesty as the chlorine and sun fades the fabric over time. Stay tuned for more as I finish sewing up the rest of my swimsuit fabric stash. And in the meantime, I encourage you to check out the new range of Liberty of London swimsuit fabrics on offer in The Fabric Store’s online shop. This entry was posted in Liberty of London, Lily Sage & Co patterns, patternmaking, swimsuit, swimwear, The Fabric Store and tagged diy, Liberty of London, sewing, swimsuit, swimwear, The Fabric Store on August 25, 2017 by Debbie Iles. I’m here to convince you that culottes really are the new skirt. And I’m not talking about the cute little flippy variety that could be mistaken for a skirt. I’m talking about the hard-core, wide leg, knee length type, or the sharp, A-line, midi silhouettes that are probably giving some of you unpleasant flashbacks right now. I admit, I get the flashbacks too. 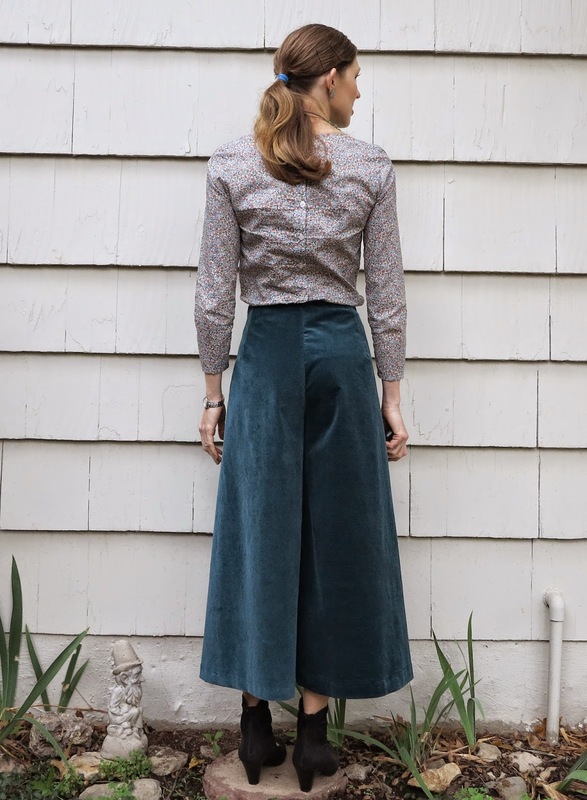 My high school sports uniform was a pair of bottle green, knee-length culottes (that memory came flooding back to me when my ‘blue’ corduroy arrived in the mail). But don’t worry, I’m quite determined to sway all you doubters out there, and to do so, I’ve put together not one, not two, but four different looks with the same pair of fabulous winter weight culottes. For Autumn, I’ve paired them with my Nani Iro top and a pair of open booties. A long pair of tan leather boots would look fabulous right now, but I don’t own any and I spend all my spare cash on fabric instead of shoes. Can anyone else relate? The fabric I used in my culottes is utterly divine. It’s a cotton corduroy by Thread, with the most beautiful velvety sheen I’ve ever seen. It’s called ‘blue’ but it is most definitely a bottle green. I knew what I was getting though. It’s nothing like the dull kiddie quality cord that I’ve sewn with in the past. I should have paid more attention. I do all my fabric cutting and sewing in the evenings in poorer light than I would like, but that’s just the way it has to be. I don’t have time to sew during the day. So I happily cut into my gorgeous fabric, positioning the legs in opposite directions and paying complete disregard for the nap. I merrily sewed away at the project until I tried my culottes on to decide on the hem length. The lightbulb suddenly went on in my head. Nap! Why did I not consider this first? I thought I’d made a total blooper of these pants. One leg was clearly a different shade to the other. I think the difference in nap looks more pronounced in artificial light, and from my persepective as the wearer, looking down at an acute angle. It is such a silly mistake to make that I still feel like giving myself a slap. Anyway, they are so comfortable and warm that I’m just going to wear them anyway. I think it’s pushing it a bit far to call it a design feature so I’m just going to feign ignorance. What, my legs are different shades of bottle green? No way! It’s a shadow. Go get your eyes checked! For view two, I opted for a more vintage feel. I’m wearing my Liberty of London Kanerva with them this time. The pattern I used to make these culottes was based on the Esther shorts pattern by Tessuti Fabrics. My modifications were pretty simple. I added a 10cm pleat to the front legs. I also widened and lengthened the legs. I really like how they turned out but next time I will definitely add in-seam pockets. I also tried my culottes out with my new favourite shirt. I like chambray with cord. Hubby isn’t too sure about this combination. He can’t decide whether I look like Anne of Green Gables, a school mistress, or Brethren. And finally, I paired the culottes with my black ponte and leather top for a slightly more edgy look. I like the silhouette of a cropped top over high waist pants. Here’s a summary of the four looks. Which one do you like best? And more importantly, when are you going to make a pair! 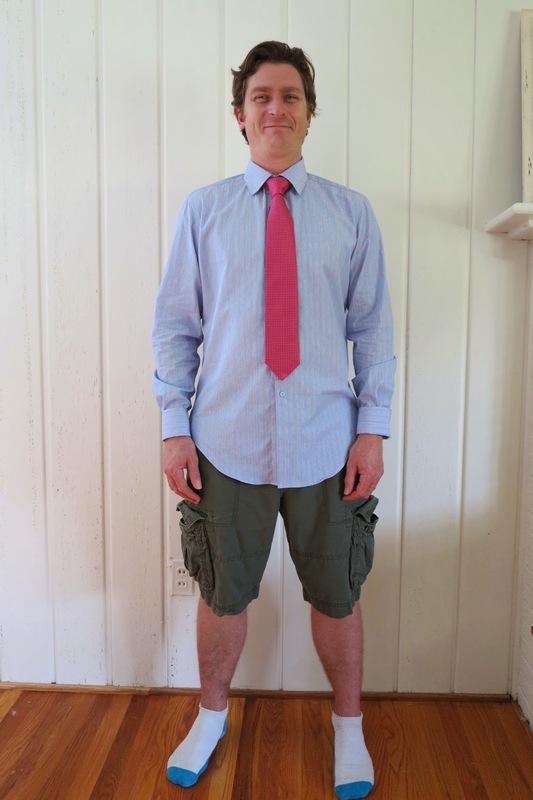 This entry was posted in chambray, corduroy, culottes, Esther shorts, leather, Liberty of London, men's shirt, Mood, Nani Iro, ponte, shirt, Tessuti Fabrics, Tessuti patterns on October 9, 2014 by Debbie Iles. And here it is, my last stop on the Two-Piece Set-Acular train. It’s not that I don’t want to make any more, but I just don’t need any more two pieces. I’ve made a few this season already. But what’s one more between friends? This glorious maxi skirt was only intended as a separate. My plan was to wear it tran-seasonally, paired with my oversized wool jersey top and possibly some tights underneath. The skirt is a simple, self-drafted number. It’s hard to make a mistake with something so simple, but I did forget to put in pockets. Side pockets would have made this skirt perfect. Of course, being floor length, my girls swooned at the sight of it. Miss Four put in her order for an identical copy. I had just enough left over to do this. 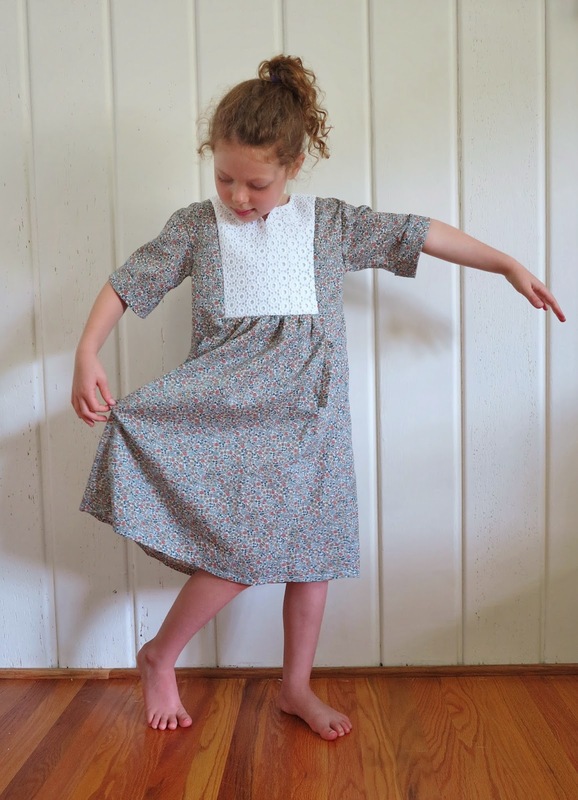 The little mischief is wearing her hand-me-down Liberty playsuit in these photos. She was perfectly mirroring all my poses behind the tripod so I said she could jump in and join me for the last few. Her one goal in life right now is to be inside the TV. The top is a design you’ve seen before. It’s made up to the same pattern as my white version (here). I just skipped the peplum. I really love this little top. It’s so cool and comfortable, and just the right cropped length for me to feel comfortably covered. I can see myself wearing it a lot with jeans. 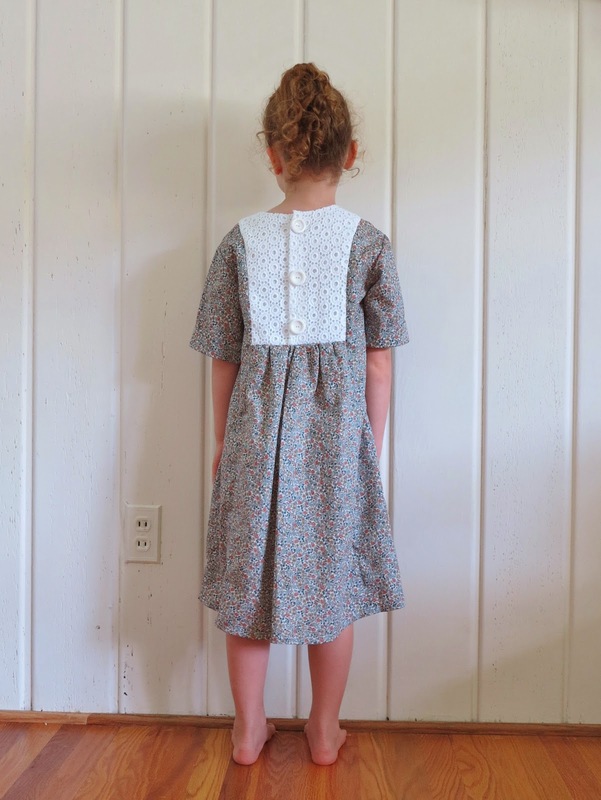 This entry was posted in cotton, Liberty of London, maxi, Mood, playsuit, Salme, self-drafted, skirt, Tessuti Fabrics, top on August 31, 2014 by Debbie Iles. I’m slowly getting better at making business shirts. I’m proud to say that this is my best shirt ever. It’s still not perfect, but I’m heading in the right direction. 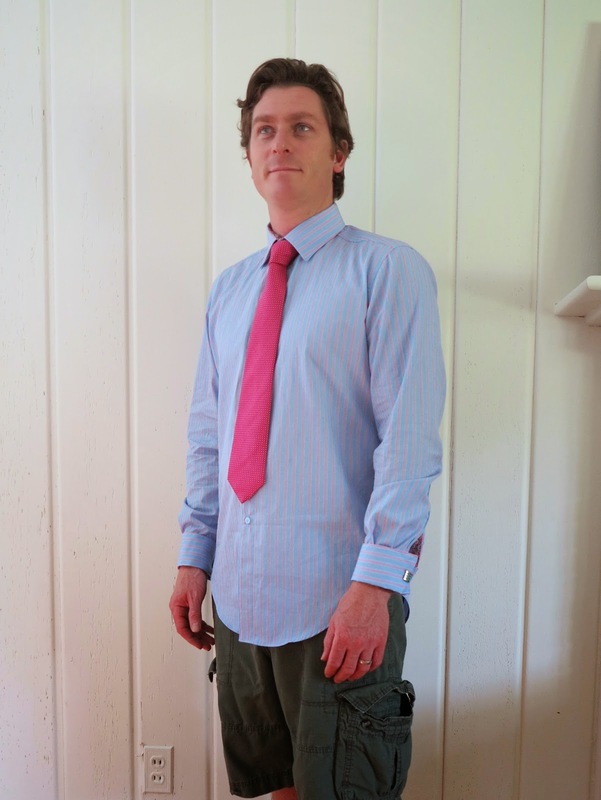 The last couple (here and here) of Kwik Sew shirts I made seemed okay at the time, but the fit wasn’t as good as it could be, and my experimental flat felled seams fell a little short of the mark. This one is much improved. I didn’t make the tie, but hubby felt it was necessary to include it in the photos, not because my stripes weren’t perfectly lined up down the front (they were!) but probably because this is the first shirt that actually fits his neck perfectly. He was a wee bit excited! Too excited to don trouser pants in fact. The shirt is a slimmer fit due to the two fish eye darts I added to the back. The darts weren’t in the original pattern, but they were easy to add. I like the collar shape better as well. Hubby went on a bit of a RTW shirt buying spree after we landed in the US (he was desperate!). As much as this pained me, he did bring home a couple of beautifully made shirts which I have been able to compare and analyse to improve my own shirt making. 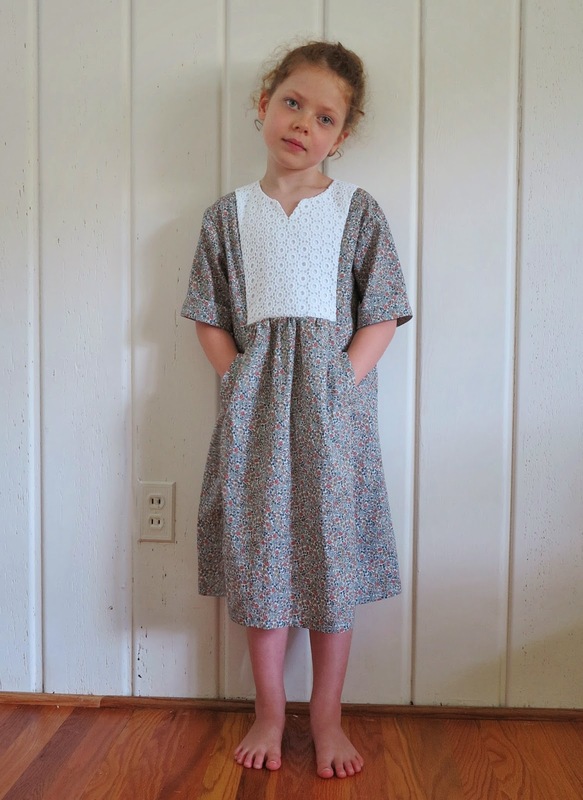 The pattern I used is Simplicity 6138. It’s a Henry Grethel pattern. 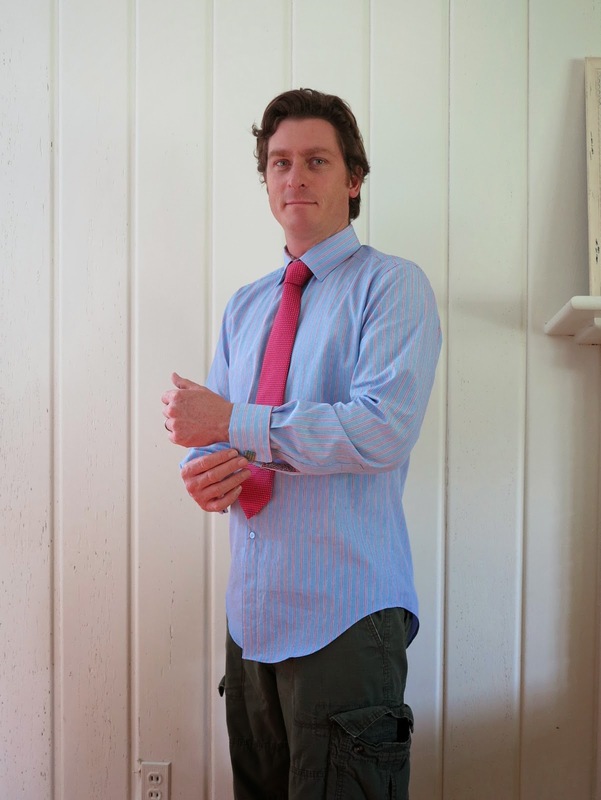 Since I hadn’t sewn this pattern before, I compared the pieces to his very new and very favourite RTW shirt. 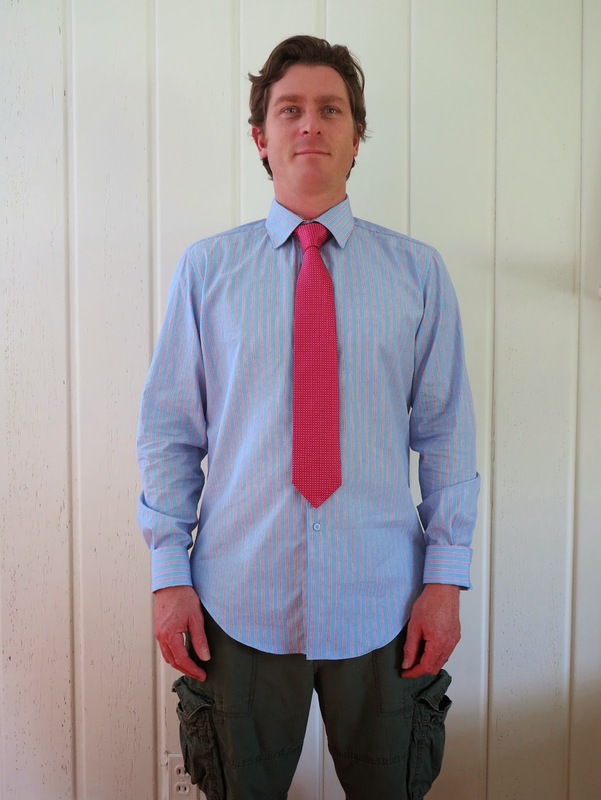 I also used the RTW shirt to figure out how to make the contrast part of the inner cuff placket. It wasn’t difficult, but of course I didn’t photograph how I did it. It’s not that I forget to take the photographs. I usually just lack the confidence that my experiments will work out in the first place! I shouldn’t doubt myself so much. I’ve never been completely happy with the interfacing of my collars and cuffs. 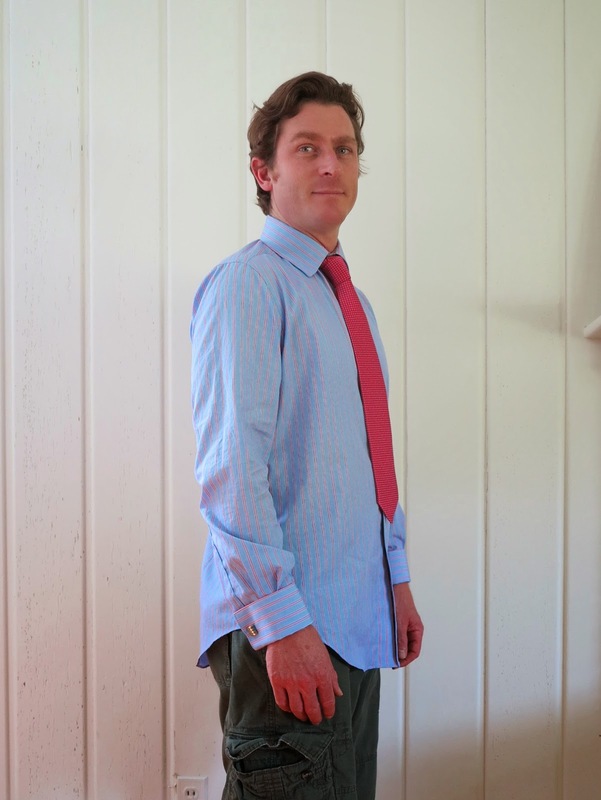 Hubby’s best shirts only have interfacing on the outside fabric piece of the collar, not on the inside. I realise now, that this allows the collar corners to be made so much sharper than I’ve been able to do in the past. The interfacing they use in the RTW shirt is also so incredibly stiff, like nothing I’ve ever encountered before. I wasn’t quite sure what to do about it, but then it dawned on me that I could double up my usual interfacing and fuse them together as one to the one collar piece. 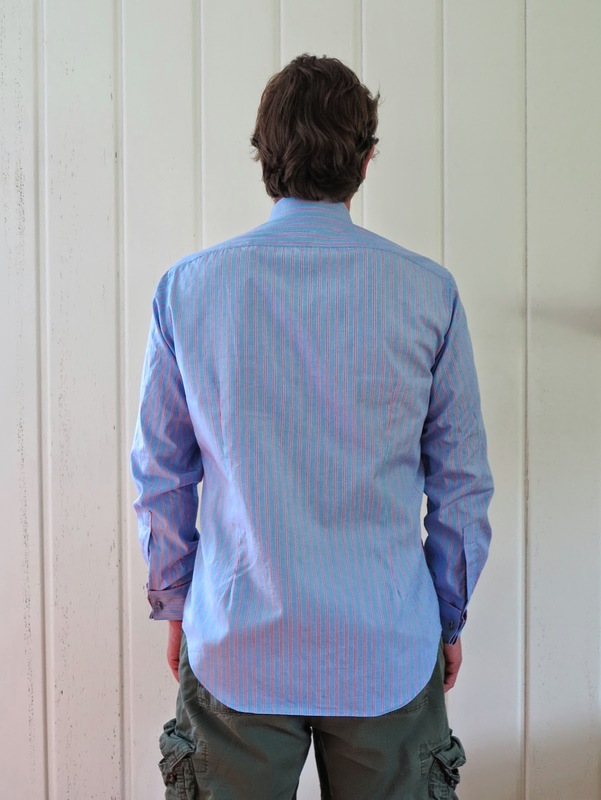 I used Prowoven shirt-crisp fusible interfacing, doubled up, from Fashion Sewing Supply. It worked beautifully. It is my stiffest, sharpest collar yet. I only used one layer of the same interfacing for the collar stand so it was much less stiff. Next time I would use two here as well, or possibly one layer of shirt-crisp and another ever so slightly less stiff one. I think the collar stand needs to be very close in stiffness to the collar or the collar doesn’t roll back quite as nicely as it could. 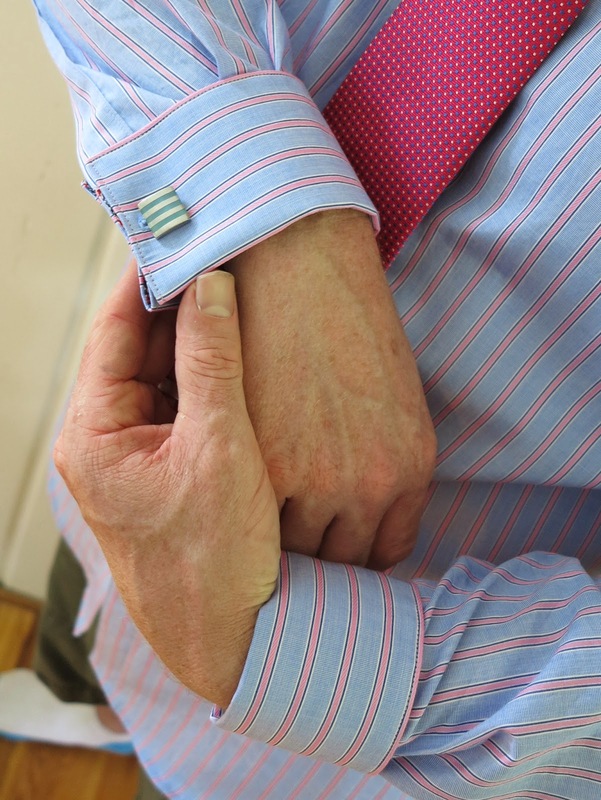 For the first time ever, the pattern actually included French cuff pieces. I usually draft my own for other shirt patterns because this is what hubby prefers. I only fused one layer of the same interfacing to the outer cuff, but because a French cuff is folded over, this was firm enough. I’m not sure those cuff links match hubby! But that’s enough of my technical musings. 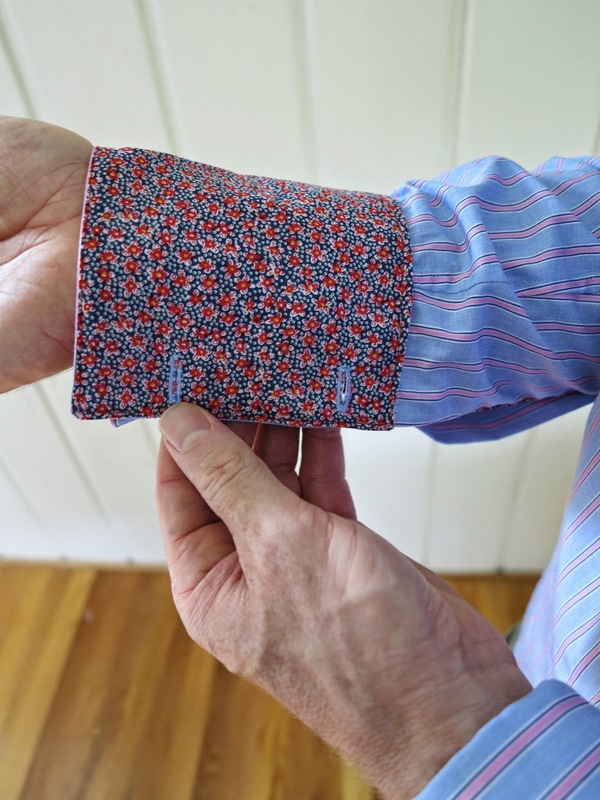 Do you love the sneaky Liberty of London on the inside of the cuffs and plackets? 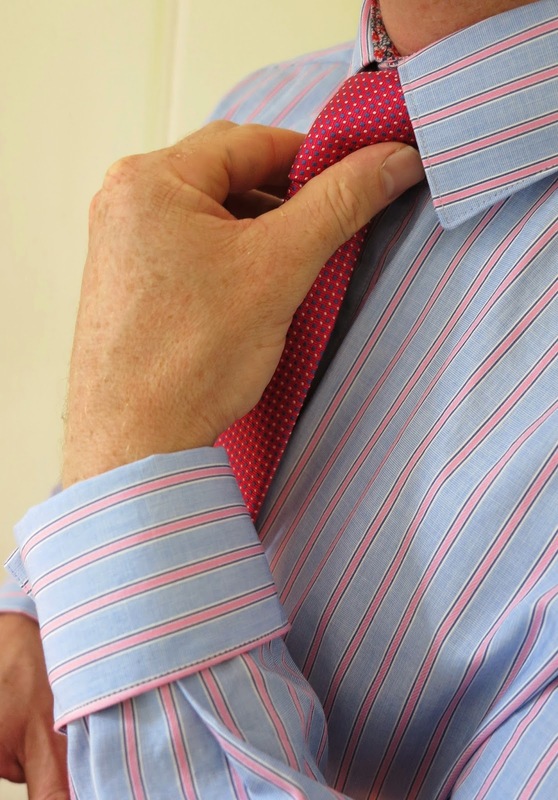 I should also mention that both the shirting and the Liberty were chosen by hubby on his recent NY trip, specifically for this combo. I’m impressed! 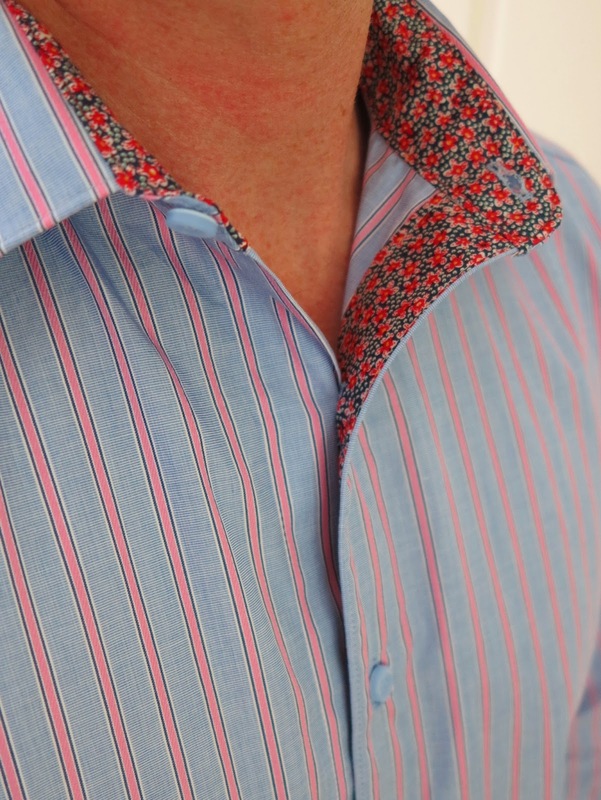 This entry was posted in Liberty of London, men's shirt, Mood, shirt, shirting on July 18, 2014 by Debbie Iles. 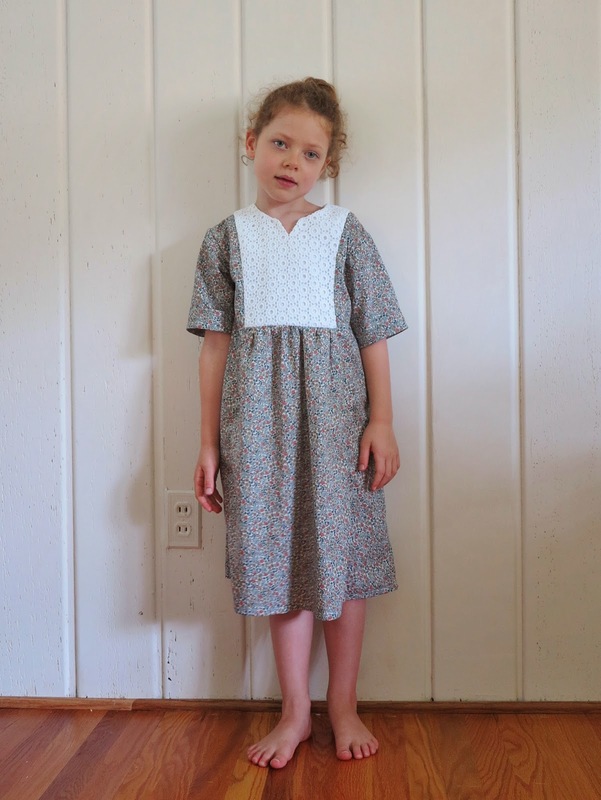 I’d originally planned on making this dress up in white linen and lace for Miss Six, using an unloved skirt and other scraps. It would have looked lovely. But in the end, I was thwarted at the cutting mat when I realised my fabric scraps were just too short. The pattern pieces are quite long, because the side panels extend from shoulder to hem. I ended up using some Liberty of London from my stash and another strip of lace used earlier in a Kanerva hack. I cut a size 7 for Miss Six. I think the fit is great (just like Miss Four’s version). There’s still a bit of room for growth in it, but it doesn’t swim on her. I can see Miss Six getting a lot of wear out of this when she heads back to school. It will be cool and comfortable but it still covers her shoulders to offer some sun protection. 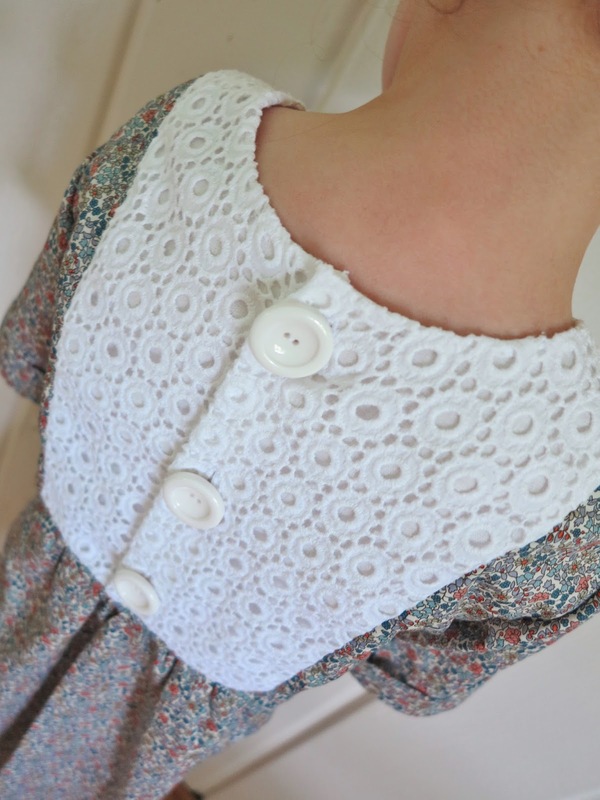 It’s a little ‘twee’ for my taste with all that floral and lace, but it got a big tick of approval from Miss Six. She loves the pockets and she was actually quite happy at the time the photos were taken. This is her current ‘photo face’. She switches off the smile when I say cheese. I tried to tell her jokes but obviously I’m not very funny. This entry was posted in dress, Lace, Liberty of London, Oliver + S on June 24, 2014 by Debbie Iles.